Presented by: Dmitry Kondratiuk, Johannes Sprafke & Dr. Amber L. Thompson. Molecules with many strongly coupled π-electrons exhibit unique optical and electronic behaviour because of the way they interact with electric fields, particularly high-frequency optical fields. The crystals of this material are highly prone to solvent loss as well as giving weak diffraction. Data were collected on I19 at Diamond and the structure featured on at least four proposals at Diamond and the SRS (Daresbury) before it was finally determined. 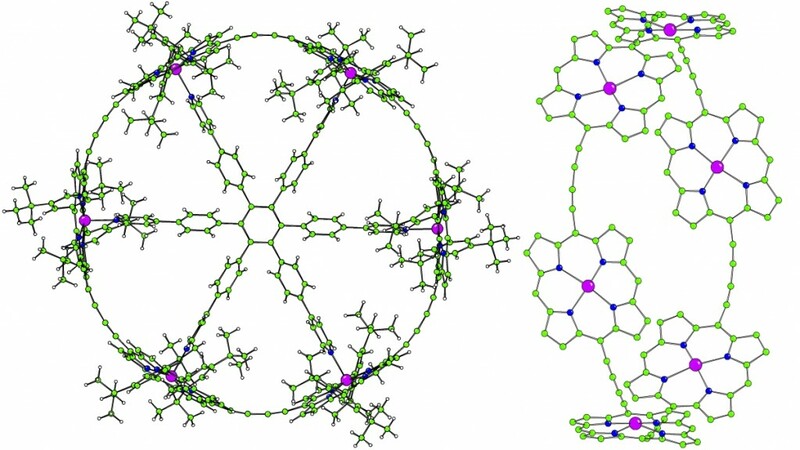 Butadiyne linked porphyrin oligomers are generally expected to be rigid, but this structure shows that they are actually quite flexible and can be severely bent to form this highly strained ring.